Playful's Lucky is a Sable and White Male with a narrow blaze and such a sweet, loving, playful puppy and he has alot of fun attitude to boot! His Parents are clear of PRA1, and NADS, Von Willebrand, so this means the puppy is clear. Parents have had vet check Eyes, Heart and Patella's also. Mother is Playful's Tremendous Beauty at 11" at shoulders, and Father is Cadaga Xcel at 11" at shoulders, which is at the top end of the AKC Standards. Both parents have very large ears and it took mom's ears several months to lift up. They are teething now so ears are doing their thing. Phalene does run in the pedigree but we only had one phalene produced by mom. I prefer a pet/agility/Performance or Therapy home but if someone is interested in a qualified show home then we can discuss it to the right show home. Vaccinations/de-worming is up to date upon leaving our home to yours. Lucky has been Micro chipped. If your interested in Lucky, Please scroll down to the bottom of the page and fill out the application. Please call me at the number on the bottom of this page if you did not hear back from me. (required 1/3 non-refundable deposit to hold your puppy, travel cost is the responsibility of the buyer) We prefer him to be picked up in person and fly on board and not in Cargo) Thank you so much MaryAnn of Playful Papillons. My papillons will be up to date on vaccinations and worming according to my veterinarian schedule. 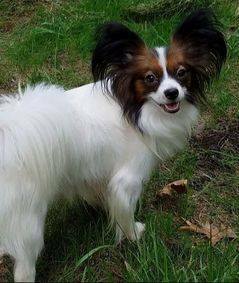 Playful Papillons are very loving, playful, sweet, active and make wonderful pets that can also do performance, agility, obedience, and be therapy dogs. STEP 2: Please call me at 530-367-2702 or 707-496-2421 (PST) and fill out the application ..occasionally i do not receive the applications. When you call please leave a message with your phone number incase I am outside. This way I can better serve you. STEP 3: Once your interested in a Papillon of your dreams, I will call your veterinarian as a reference. STEP 4: A contract will be discussed and signed if you want the Papillon. STEP 5: 1/3 Non-Refundable deposit is required to hold your papillon 15 days prior to leaving - If you choose you can have my veterinarian do an exam or you can have your veterinarian do an exam. If my veterinarian does the exam and it does not pass the Non-Refundable deposit will be refunded prior to departure. STEP 6: Arrangements to meeting your new Papillon will be in order. Any transportation expenses are the responsibility of the new owner.